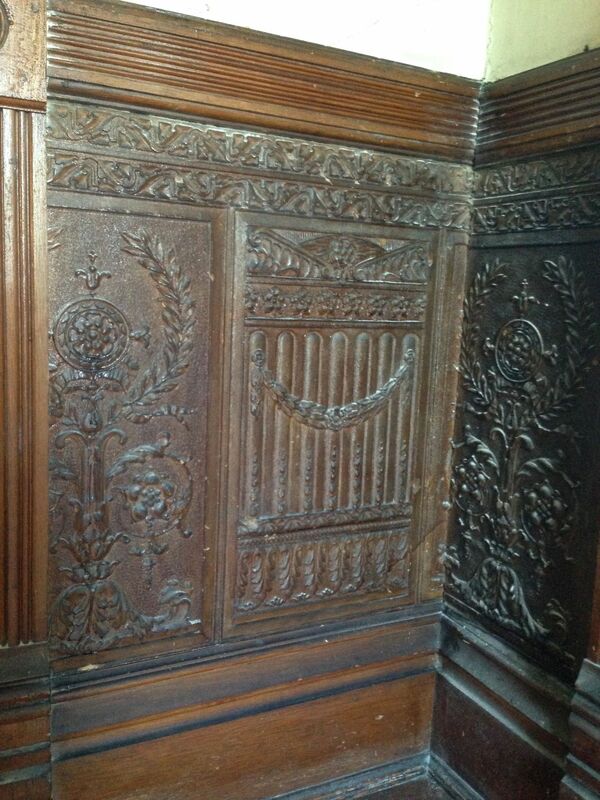 The first floor of the Cross House is blessed with a lot…a lot…of Lincrusta. When I gently point out that this is not correct, and explain that the wainscoting material is actually linoleum, I am met with sympathy and a shaking head, as it is obvious to them that I know nothing. “But, everybody knows that is hand-tooled leather!” When I further explain what Lincrusta is, the look of sympathy increases, combined with a hint of annoyance. And I can hear what they are thinking: This guy knows nothing! Geez! In anticipation of a gala tomorrow evening in the house (my first! ), I have been scouring and vacuuming and polishing and burnishing. As such, the Lincrusta has been assaulted with a toothbrush and a wet rag laced with Murphy’s oil soap. After. The round tower. Tomorrow evening there will be a harpist playing in the tower. I am breathless with anticipation. More after, more round tower. I look forward to dealing with the alligatored shellac on the trim. In time my little pretty, in time. It has been exhausting but pleasurable getting the house clean. Of course, this antiseptic state will last but briefly. No matter, for my memory of this temporary state will outweigh the reality of a few weeks hence. I love the look of the Lincrusta wainscoting. 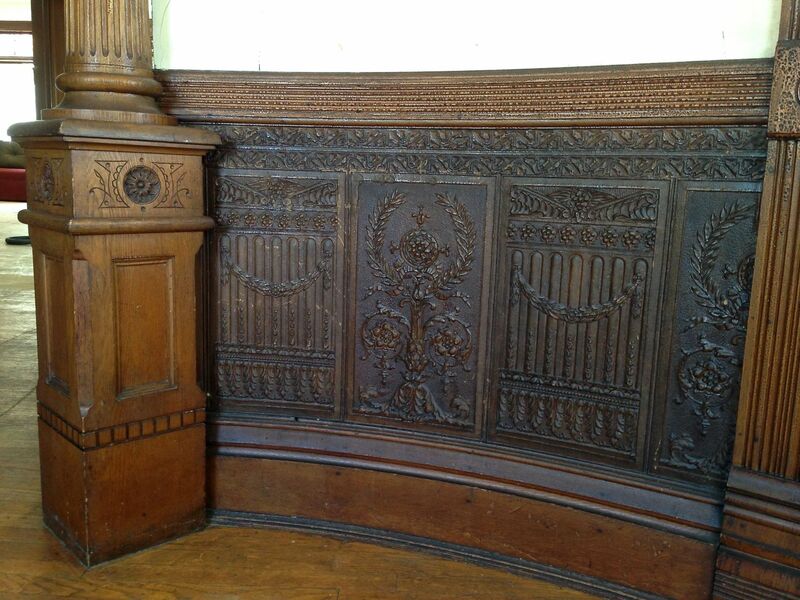 The decorative details in your house are so awesome and I feel a little jealous. I’m certain your gala tomorrow will be a grand success. Enjoy…you deserve this. Your lincrusta is gorgeous! I don’t know how many times I have seen it called tooled leather in real estate ads or on home tours, but I have kept my mouth shut, as I know I won’t be believed. I had never heard of lincrusta until after we bought our (now former) house in 1985. My spell check is even trying to tell me it isn’t a real word! Your attention to detail is inspiring. I can’t wait to see it in person. You might simply suggest when they get home they Google it to see who is right. GORGEOUS Lincrusta! Wow. So beautiful! I love it. 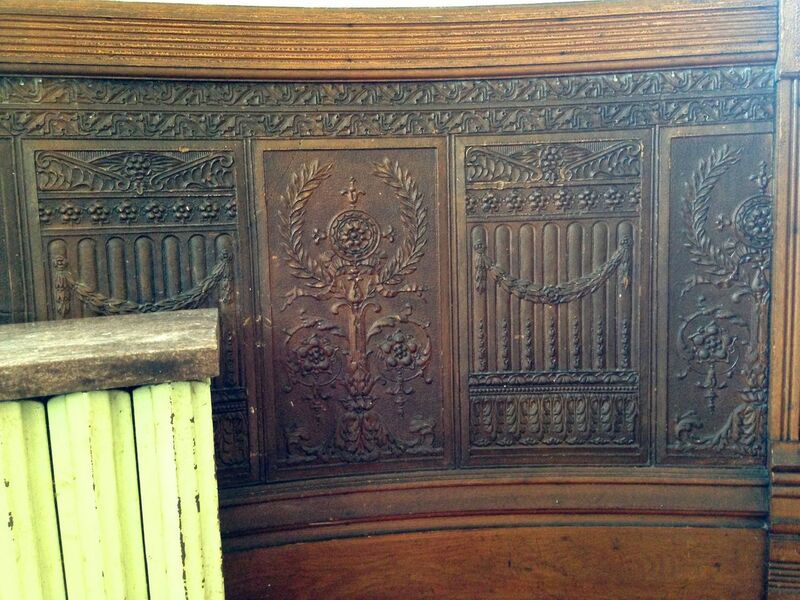 I had no clue what Lincrusta was, before this post of yours, and I definitely qualify as an old house nut. Thanks for sharing & educating; now, I am coveting large areas of Lincrusta…sadly Lincrusta won’t work in my present home. Please take and share lots of pics of your gala party, of the harpist playing in the tower, etc. etc. Is it a black tie event? I love getting dressed up in formal dress, and there are so few opportunities to do so. Have a wonderful time! (I know you will!) 🙂 Cheers. Best wishes for a fabulous party! You’ve introduced so many good vibes into the Cross House the past year, this seems like a natural progression, the first of what will hopefully be many festive events. Cheers! That Lincrusta is the stuff of dreams. So delicious decadent and detailed. Your cleaning really made it ready to face another 100+ years in pride and style. Bravo! What an exquisite example of this material! I can’t believe the beautiful state it is in. Alas, we have only the shadow of what once was Lincrusta in our main hallway, but the beautiful birds and flowers Lincrusta panels over the doorway were still present, and are currently being restored. OMG! Is this THE Carla? Of the Danville Experience???????? That is incredible artwork, and even more incredible that it’s survived! You have just presented me with another house-related obsession and possibly the most amazing solution to my dining room design.